Musaic's mission is to share beautiful men's a cappella singing with our Bay Area community. Our music is rooted in classical choral traditions, through a repertoire of many genres and languages. The members of Musaic are passionate about men's ensemble singing, and enjoy the artistic balance and musical fellowship it brings to our lives. Musaic was founded in 2000 as a few friends gathering to sing for our own pleasure. We took the name Musaic to represent a mosaic of song and voice. Since then we have performed over 100 concerts and produced five recordings. Oh Say, Can You Sing? 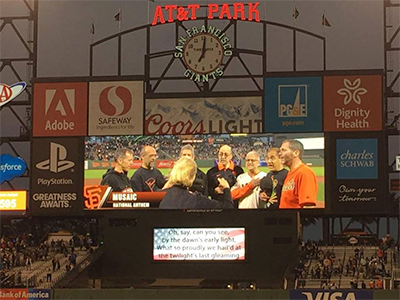 - We recently won a contest allowing us to perform the National Anthem at the September 29 San Francisco Giants game (a bucket list item). The arrangement was commissioned for Musaic by Bret Silverman. Magnificat - Musaic entered another contest performing a Magnificat arranged by Alwin Schronen. It doubles as our first music video! We recorded it on 9/11 in San Francisco, and we'll find out if we won on Dec 1. Bohemian Rhapsody - Checking off another bucket list item was finding and performing a good men's arrangement of Bohemian Rhapsody. Christmas Concerts - We are looking forward to our Christmas concerts on Dec 11 in San Rafael, and Dec 17 in San Francisco. Listen to clips on our Recordings page. See Musaic's past performances and community events. Look at a list of our repertoire. Musaic is always looking for talented male singers. If you're interested in auditioning please fill out the following form and click Submit. Your information will be forwarded to our artistic director who will contact you if we have an opening that matches your skills. Visit our Auditions page for more information. Musaic's current members bring to their vocal music decades of combined musical experience in community and professional or semi-professional singing groups. After a 25 year history as director of music, choir director and soloist, as well as being an occasional guest clinician with various local choirs, Linda is very excited to step into her new role as director of Musaic. She has a long history with the group, having been the voice teacher for several members over the past 10 years, as well as an avid fan. A coloratura soprano, Linda holds an extensive performing history throughout the continental U.S. and western Europe, in opera, musical theatre and oratorio. Favorite leading roles include Zerbinetta, Baby Doe, Cunegonde, the Queen of the Night and Olympia. Equally interested in musical theatre, she has played leading roles in Pirates of Penzance, Carousel, Oklahoma, among others. Linda holds her Master�s degree in Opera Performance from University of Texas at Austin and a B.A. in Music from California State University, Long Beach, and has studied conducting with world renowned choral master Frank Pooler. Since 1997, Ms. Noble Brown has been the vocal instructor at College of Marin. A member of the National Association of Teachers of Singing, she has an extensive private studio. Originally from Riverside, CA, Linda has been a resident of the Bay area since 1990. In the early part of her career she sang background vocals with the Carpenters and once sang on a country and western album with a British country star in Germany. She has been on three game shows (winning each! ), ran the Big Sur marathon and has one tatoo. She has two wonderful children, Meghan and Ian, the cutest dog in the world, Seele, and is deliriously happily married to the love of her life, Ken. Tom has been performing for almost as long as he can remember. His love for singing began when he was cast in the title role of "Oliver" and continues today with Musaic. He received his bachelor of music degree in voice performance from Boston University's College of Fine Arts where he had the good fortune to study voice with Shirlee Emmons. After graduating he moved to New York where he joined the throngs of performers hopeful for a career in musical theatre. After four years of modest success as a professional performer, he changed career paths and is now working in the travel management industry. Tom moved to the Bay Area in 2000 and has performed with the San Francisco Bach Choir and was invited by San Francisco State to participate in their production of Mozart's "The Magic Flute" in 2005. He is extremely excited to be singing again and as a new member of Musaic. Arie's musical training started on folk guitar at age 10, eventually shifting to voice when he became the lead singer of a rock band in high school. Feeling that he desperately needed vocal training to handle the stratospheric high notes of Journey, Rush, and the Police, he joined the choir and started voice lessons, quickly catching the classical music bug, which transformed into a lifelong addiction. 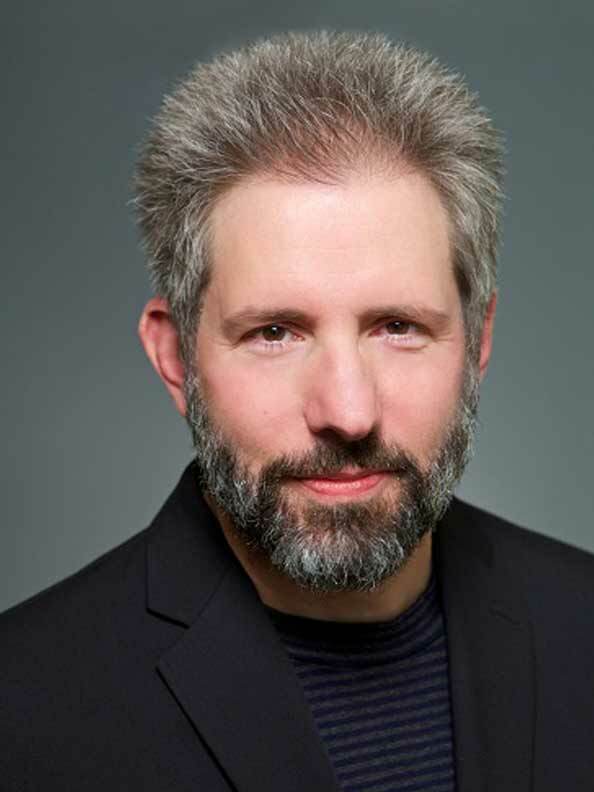 Although he is primarily a physician and currently serves as Professor of Pathology and Chief of Neuropathology at UCSF, he has also been a professional chorister and soloist for over 30 years, singing with many groups, including the Dallas Bach Society, Rochester Choral Arts Ensemble, American Kantorei, San Francisco Concert Chorale, San Francisco City Chorus, Oakland City Chorus, and the American Bach Soloists. His solos have ranged widely, but mainly focused on works from the Baroque and Classical periods. He has also written and recorded an educational CD entitled �Neuropathology Songs�, which utilizes music to help medical students remember salient features of common Neurological disorders. This novel teaching tool has been the topic of media stories by the St. Louis Post Dispatch, Washington University Record, KWMU radio, American Public Media's Marketplace, and Singer Network, a service of Chorus America. Arie moved to the Bay area in 2010. He is living with his amazingly supportive wife, Andrea and has two wonderful children, Ryan and Jaclyn. Christophe began singing in an a cappella group at age 8, when he was selected as a soprano soloist for Les Petits Chanteurs de Sainte Jeanne d'Arc, a prestigious french choir that dates from 1954. More recently, after moving with his family in the Bay Area, he participated in Alan Petker's Concort and later joined a jazz formation called The Baytones. While his evenings are filled with music, Christophe's daytime is about image making, more specifically about designing lighting and shading algorithms at Pixar. A founding member of Musaic, Andy's interest in vocal music began at four years old when reciting the Four Questions during Passover. No one has been able to quiet him since. In high school, he played the Captain in Anything Goes. Later he sang with the Lesbian/Gay Chorus of San Francisco where he performed one of his favorite choral works, Poulenc's Gloria. Before co-founding Musaic, he sang in Equal Voices. Outside the group, Andy works as a Business Consultant, provides a lap for his beloved cat Kyoto, and enjoys being married to baritone, Matthew. Matthew began his lifelong a cappella love affair studying with Phyllis Zimmerman at Santa Barbara High School. He loves the rich, Midwestern choral sound and speaks passionately about the power and wonder that ensemble singing holds for him. He sang in every vocal ensemble the University of Oregon had to offer, and later with the Eugene Concert Choir and Vocal Arts Ensemble, and GMCLA, among other groups. Matthew is proud to be a founding member of Musaic. His non-singing career is in the hospitality industry planning meetings and events at AAA, and he serves as immediate past president of MPINCC (Meeting Professionals International Northern California Chapter). Whether for work or preferably with his husband Andy (Tenor), he enjoys traveling and exploring the music and mysteries of the world, near and far. Throughout his musical life Steve has always focused on chamber music of various genres: guitar and bass in rock & jazz groups, cello in varied chamber settings, and small-group a cappella singing. He has also done music directing for theater productions, and received a degree in composition from the San Francisco Conservatory in 2012. He began singing during his time at the Conservatory�increasingly so once he had switched majors from cello to composition. Upon graduation he commenced formal vocal study with tenor Jonathan Smucker. He has sung in both the Conservatory�s choral groups, the Marin Golden Gate Barbershop Chorus, and the NYC-based men�s quartet The Gentlemen Carolers. In addition to singing with Musaic, in 2015 Steve founded and sings in a chamber music series, chamber/text, devoted to presenting work of composers who have written for voice in chamber-music settings. Steve lives in San Francisco with his wife Sara and their cats Jake and Maui (who does happen to have a singing video on Youtube!). Chris found his love of a cappella music while at Harvard as an undergrad, where he performed with the Harvard Krokodiloes. Since then he has contributed bass lines to a number of groups up and down the eastern seaboard�the Spinouts (in Burlington, VT), the Dinosaurs (in Cambridge, MA) and the Local Vocals (in Chapel Hill, NC). He moved to San Francisco a few years ago and is thrilled to have found Musaic. In his day job he is a professor of medicine at UCSF and lives in Mill Valley with his fab-ulous wife Barbara, their budding a cappellist son, Joshua, and ridiculous dog Hazel. Rich�s love of music began in early childhood, playing piano, various brass instruments and singing in choirs. While an undergrad he and a friend co-founded M.I.T.�s original co-ed a cappella group the Chorallaries of M.I.T. He subsequently sang with various other small a cappella groups- Off at Five in Boston, the Men�s Octet at U.C. 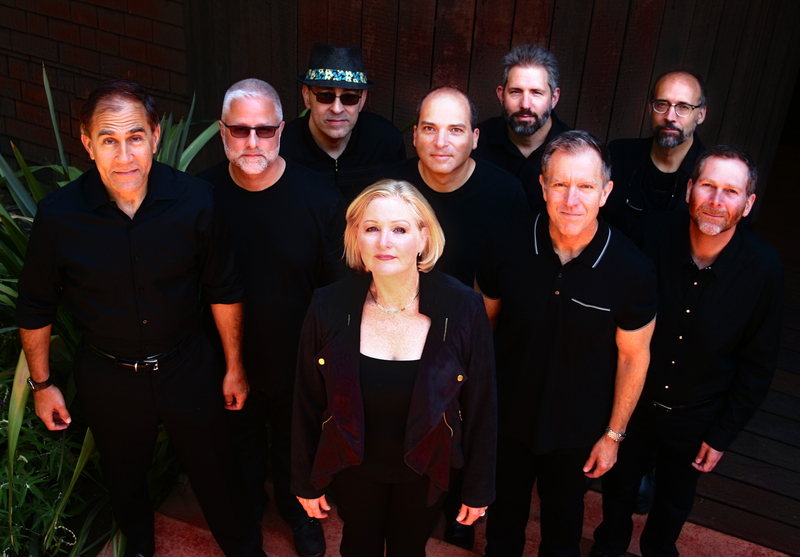 Berkeley, the Baytones jazz ensemble in Marin, and Just Voices, Singer Marin�s professional a cappella group. Regretfully, he also needs to maintain a day job in order to buy dog food for Sparky (the family�s Havanese), keep a house, make his wife Susan and sons Michael and Adam happy, etc,. He chooses to do so as a principal at Polsky Perlstein Architects, a small office in Larkspur that specializes in custom residential design.